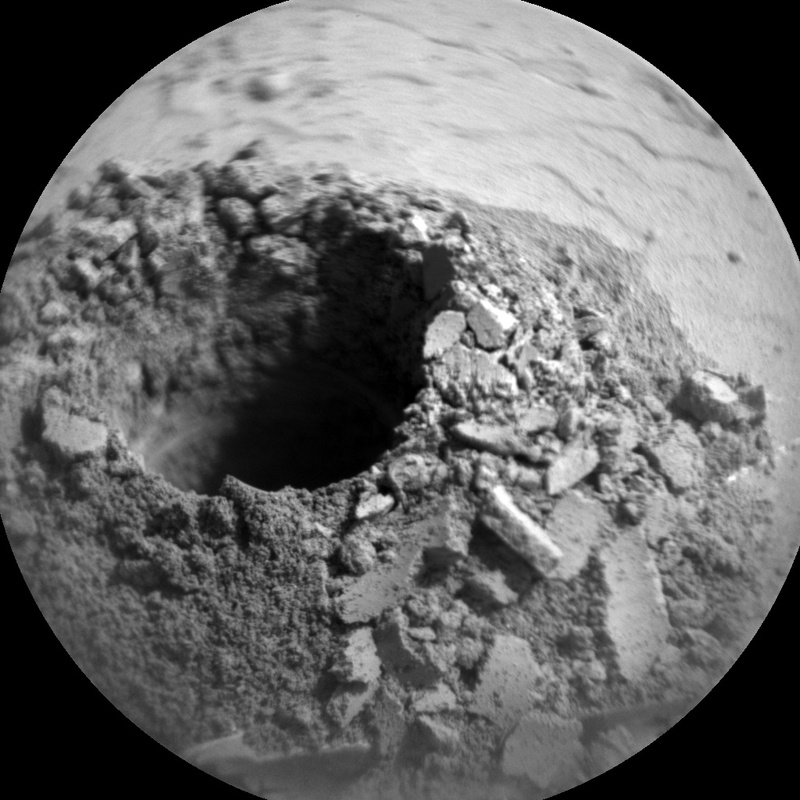 Sol 2059-2060: Characterizing a Successful Drill! This past weekend, Curiosity successfully drilled into the "Duluth" rock target, generating a beautiful pile of drill tailings! This is a very exciting time for us on the rover team, who have been waiting for quite a while to successfully drill into a target and to ingest samples into the rover's analytical instruments. Before we are able to use all of our instruments, however, we must first characterize the nature of the materials that were collected during the drill activities. So, on Monday, the science team planned for the characterization of three small portions of the collected sample that were to be dropped onto the surface in front of us so that we could image these materials at high resolution. While these efforts were not primarily driven by science (the rover engineers were more interested in the nature of the sample and whether there would be any difficulties in delivering the sample to Curiosity's instruments), the science team didn't dare miss an opportunity to make some cool measurements of the new materials in front of us! First up in Monday's plan was multispectral imaging of the drill target and some regular visible imaging of a small patch of sand ripples named "Esko." The drill target observation was requested to help determine how the interior of the Duluth target differs from its surface, while the imaging of Esko was used to see if there is any motion of the Esko ripples over time. ChemCam was then used to passively image the drill hole, and then to actively characterize the chemistry of the drill hole and drill tailings using its laser instrument. Mastcam and ChemCam imaging capabilities were also used to acquire high-resolution images of the small test portions throughout the plan. The next day's science plan had two Mastcam observations - one of the small portions and one of the Esko ripples - both of which were designed to identify whether the wind had modified these surfaces at all. Environmental measurements were also made on the second day to search for both cloud motion and dust devils. We're all very excited to continue on with drill activities and to make some long awaited measurements. Stay tuned for more updates as the week progresses!